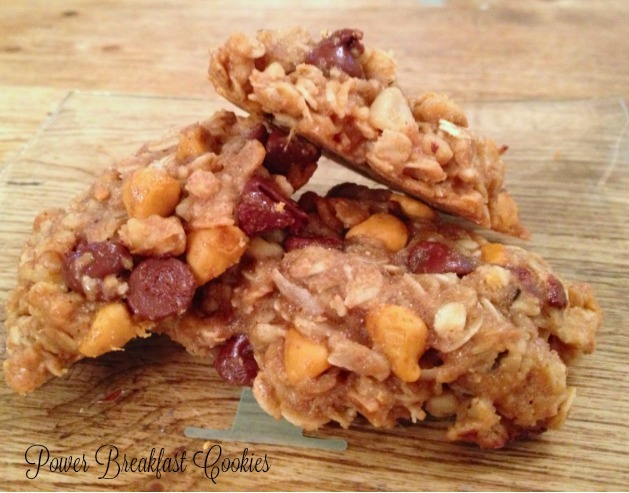 These yummy power breakfast cookies are loaded with healthy ingredients such as oats, flaxseed, almond butter, and walnuts. I call these “power breakfast cookies” because they are packed with healthy, natural ingredients that provide a great start to anyone’s day. The flax and oats provide whole grains, while the almond butter and walnuts provide healthy fat and Omega-3’s, respectively. These cookies can be tweaked by using a variety of “mix-ins.” The 2 cups of nuts and baking chips can be changed according to preference. Mix in’s can include nuts, seeds, dried fruit, and assorted baking chips (peanut butter is one of our faves). Although you may have to buy several ingredients that you don’t commonly keep on hand (spelt flour, coconut oil, almond butter & ground flax), you’ll be able to use the ingredients to make several batches of these cookies. You can also freeze unbaked dough and bake cookies as needed. Note: Spelt flour is found in the organic section of most grocery stores or at Whole Foods, The Fresh Market, and Earth Fare. Spelt flour is similar to wheat but has a nuttier, sweeter (and in my opinion, yummier) taste. It is more easily digested than wheat flour. It does contain gluten but is tolerated by some with wheat allergies. 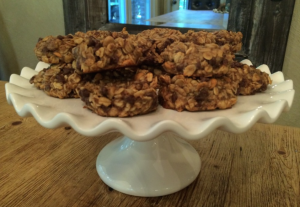 I’ve made these power breakfast cookies for several beach trips with friends. They are perfect to grab & go before heading to workout, hit the beach, or just relax. Whether traveling or at home, these cookies are a huge time saver. Whip up a batch or two, and you’ll have breakfast taken care of for days. If you try these, please let me hear your thoughts. What add-ins did you use? Did your family enjoy them? I love hearing from readers and getting feedback. As always, thanks so much for stopping by. Be blessed, and stay savvy!!! Line large baking sheet with parchment. In large bowl, add oats, flour, salt, cinnamon, coconut, nuts, and baking chips~toss well. In small bowl, add flax, honey, almond butter, vanilla and coconut oil; stir until smooth. Add wet ingredients to dry, mixing with gloved hands until well blended. Drop 1/4 cup portions onto cookie sheet, spacing several inches apart. Bake for exactly 13 minutes. Remove from oven and let cool. I agree, Parker; they are incredible! As for caloric and nutritional info, I am sorry that I don’t have that information. If I had to guess, I would say that each cookie would be at least 100 calories, possibly more depending upon the choice of add-ins. This cookies are amazing. What is your estimate on calories per cookie?